A study of the 7th Chapter of the Srimad Bhagawad Gita. 1. Bhagawaan Krishna said, “ Hear about how you with your consciousness deeply attached to me and your taking total shelter under me constantly trying to unite your individual consciousness with the ultimate consciousness, will be able to know Me completely and free of doubt. 2. I will now clearly explain to you this phenomenal knowledge and also its realisation after which there will be nothing further remaining to be known in the world. 3. Out of thousands of men, hardly one tries to achieve perfection in self-realisation and among those trying so hard to do so, there is hardly one who achieves perfection in self-realisation and among those who do achieve self-realisation, hardly one knows Me in truth. 4. Earth, water, fire, air, ether, mind, intelligence and certainly false ego together are My eight external energies. 5. But my marginal energy which is superior to this, comprises of the embodied souls of all living entities by which the material world is sustained. 6. You must know that all living things are manifested in these two energies of Mine. I am the source of its manifestation, I sustain and I am also the Destroyer. 7. Beyond Me, there is nothing superior. Everything is connected to me like pearls on a thread. 8. I am the sweet flavour in water, the radiant light of the moon and the sun, the primordial root syllable OM in the Vedas, the subsonic element of sound of the ether and the manhood in man. 9. I am also the fragrance of the earth as well as the heat of fire and the vitality of all living beings and also the tolerance in people who practise austerities. 10. Arjuna, you need to try to understand that I am the origin of all living beings, the intelligence of the intelligent and the power of the powerful. 11. I am the strength of the strong who are devoid of desire and attachment and I am the energy of procreation in all living beings which is not against righteousness. 12. And try to understand that of all which is surely in the state of goodness, passion and ignorance and all that is manifested by Me alone, you should not know Me as being in them but that they are in Me. 13. The entire universe is deluded by the threefold condition of the modes of external energy, not knowing Me as being situated above them as the immutable Supreme. 16. Among the pious there are four kinds who are devoted to me. They are the distressed, those seeking knowledge, people desiring material gain and people of wisdom. 17. Of these the one who is engaged in devotional service is superior for the one who seeks knowledge, I am dear and he or she is dear to me. 18. All these are certainly noble, but in my opinion the one of wisdom whose soul is connected to Me is with Me because he or she is solely engaged in serealsing Me as the highest attainment. 19. Therefore after innumerable births, the one who has perfected his or her wisdom understanding fully My universal reality surrenders to Me and such a soul is very rare. 20. Due to various desires, those deprived of knowledge driven by their own particular natures, surrender themselves to the demigods and they adapt themselves to their corresponding rites and rituals. 21. Whoever is faithfully devoted to whatever form of a demigod in worship as desired, I surely sustain that faith in him or her. 22. Endowed with firm faith of that demigod and sanctioned only by Me, a devotee obtains all that he desires from that demigod. 23. The results of insufficient understanding are always temporary. A devotee of a demigod obtains the demigod, but my devotee obtains me. 24. Spritually weak people who don’t understand my exalted, imperishable, finest and supreme state of being, think I manifested out of the unmanifest. 25. I am not manifest to everyone, being veiled by My illusory potency in the external energy. The foolish and ignorant cannot understand Me – the unborn and imperishable. 26. O Arjuna, I know all the past, the present and the future and all living beings, but nobody really knows me. 27. By the illusion of duality that arose from desire and aversion, all forms of life from the beginning are in delusion. 28. But those whose sins are completely eradicated by performing virtuous deeds are free from the delusion of duality and they dedicatedly engage in devotional service unto Me. 29. Those who strive to be freed from old age and death, take shelter in Me. Such people learn the ultimate truth, the embodied self and the law of action or reaction. 30. Those who know Me the ultimate principle of phenomenal existence, as the underlying foundation of all demigods and sustainer of the performance of all sacrifices, with their minds absorbed in Me can know Me even at the moment of death. Very enriching teaching of the ultimate knowledge indeed. 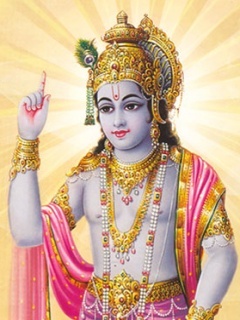 A pure hearted and single minded devotion to Krishna will lead us to him. Thank you very much for disseminating this powerful teaching that Lord Krishna gave to Arjuna and we could benefit from when we try to emulate. Hope you are fine, i have read the details which you have posted on site, regarding Mangal dosha and the geeta 7th chapter , it is very interesting to review the part of geeta & details of mangal dosha.